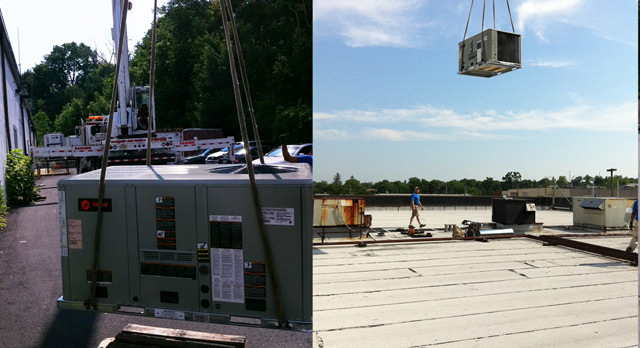 Trane 25 ton package rooftop unit lifted into place. High-efficiency meets durability. The best rooftop split system available. From design through to installation, we are a one-stop supplier for all your building’s commercial HVAC needs. If your internal space is limited, rooftop HVAC units maintain temperature control without an intrusive footprint inside your building. 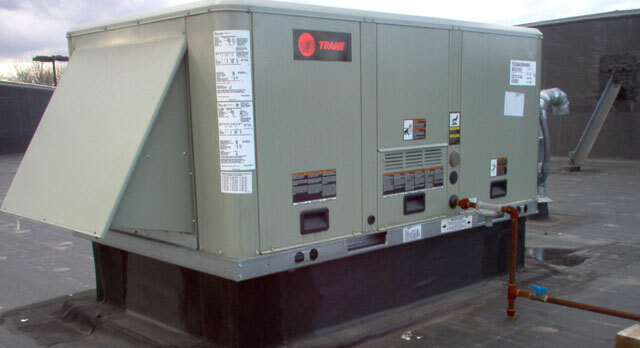 Our Trane rooftop units range from 3 to 25 tons but we have further access to various brands and capacities. In addition to rooftop unit installation we also install all types of commercial duct work, including large rectangular sheet metal systems and spiral duct systems. Remember, routinely scheduled maintenance of rooftop units is the key to their longevity and peak performance. Talk to us today about out maintenance plans.